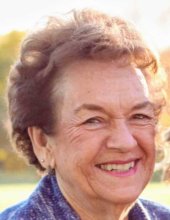 WASHBURN - Joyce E. Schroeder, 84, of Washburn, Illinois passed away peacefully at 6:55 a.m. on Saturday, December 1, 2018 at Snyder Village in Metamora, Illinois. Joyce was born in Peoria, Illinois on October 14, 1934, the daughter of W. Harrison and S. Latha (Lukecart) Safford. She graduated from Washburn High School and later married the love of her life, Danny L. Schroeder, on April 5, 1953 in Washburn. He preceded her in death on February 24, 1993. She was also preceded in death by her parents and brother, Ronald. Surviving are her three sons, Danny (Cindy) Schroeder, Jr., Dunlap, Illinois, Ronald (Peggy) Schroeder, Washburn, and James (the late Mary) Schroeder, Franklin, Tennessee; six grandchildren and three great grandsons. Joyce worked as a secretary at Caterpillar in East Peoria and later as a bookkeeper for Ulrich Motors in Washburn. She served as an election judge for many years. Joyce was also a charter member of the Snag Creek Golf Course where she was active in the Ladies League. She enjoyed watching her grandchildren participate in sporting and all school activities. Joyce also cherished the time spent with her closest friends in the “Birthday Club”. Joyce was an avid Chicago Bears and White Sox fan. She was a lifelong member and Deacon of the Washburn Christian Church where her funeral services will be held at 1:00 p.m. on Saturday, December 8, 2018, with Pastor Bob DeBolt officiating. Visitation will be one hour prior to the service from noon to 1:00 p.m. and burial will follow services at Lynn Mt. Vernon Cemetery in Washburn. The family would like to thank the staff at Snyder Village for the fine care that Joyce received during her time spent there. In lieu of flowers memorials may be given to her church. Calvert & Johnson Memorial Home is assisting in arrangements. Words cannot express how much Joyce will be missed by her family and friends, but our memories of her will always be cherished. "Email Address" would like to share the life celebration of Joyce E. Schroeder. Click on the "link" to go to share a favorite memory or leave a condolence message for the family.